The John Logan Foundation will close in 2018 after eight years of financially supporting Australians with gastro-intestinal cancers. The Foundation’s Board has announced it will gift its surplus assets to the GI Cancer Institute after closing. The Foundation was established due to the wishes of John Logan, who suffered from bowel cancer. In this time it financially supported 420 Australians with gastro-intestinal (GI) cancers, giving the ‘gift of hope’ to those faced with costly treatments. John passed away in 2008 and is remembered by his family for his strength and compassion for those around him. The funds gifted to the GI Cancer Institute will go towards clinical trials to find better treatments and improve survival outcomes for gastro-intestinal cancer patients. An official statement from the John Logan Foundation is available here. 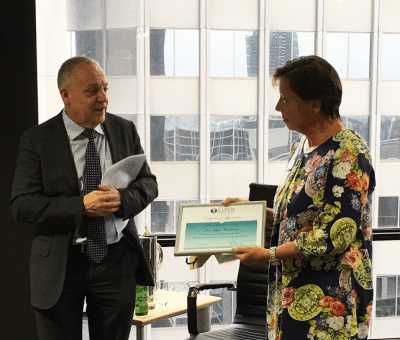 Image: Katherine Logan-Thomas, John Logan’s sister and Board member of the John Logan Foundation, receives a Certificate of Appreciation from Associate Professor Niall Tebbutt, Treasurer of the GI Cancer Institute.